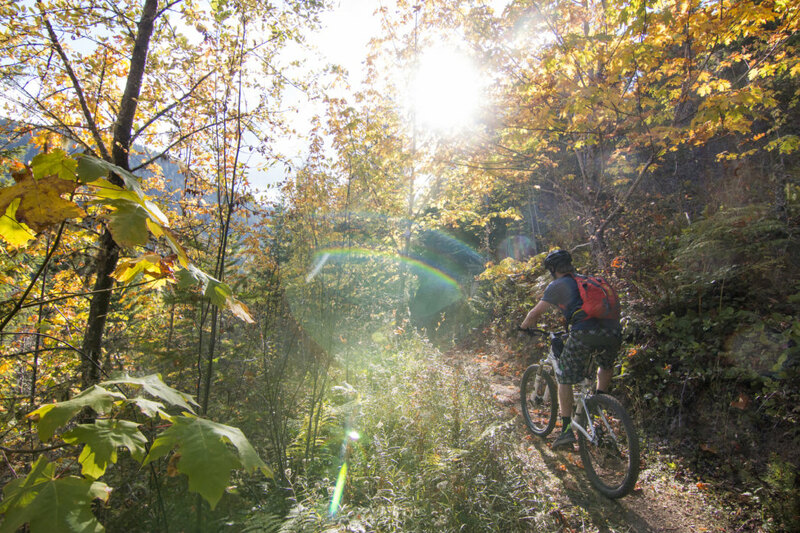 Washington’s far from an undiscovered mountain biking gem—rather, it’s got a reputation as a dirt-lover’s paradise. 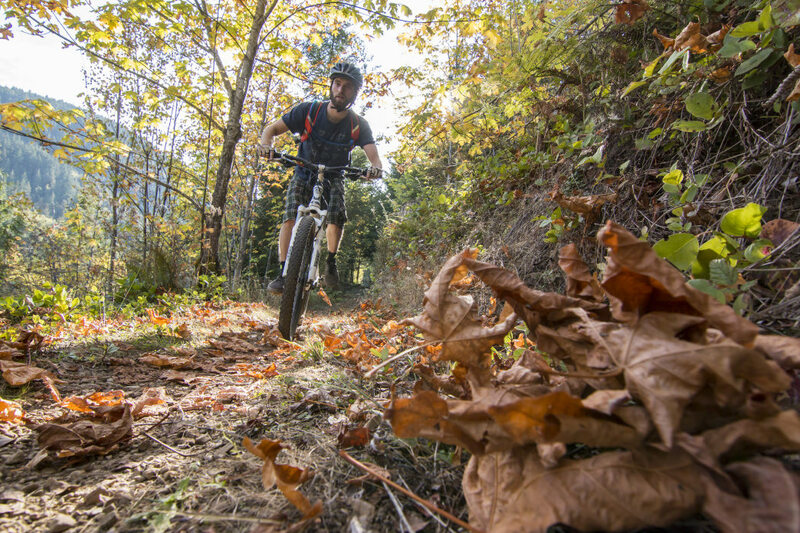 In fact, many a mountain biker would argue that Bellingham is among the best mountain biking towns in the country. Their argument is hard to contend: when rugged terrain, a maritime climate, sweeping views, Pacific Northwest vibes, and dedicated trail-builders join forces, a mecca of knobby tires is born. While Washington is renowned for some of the most flowy and fun trails in the U.S., the Olympic Peninsula doesn’t enter the conversation nearly as much as it could or should, namely because the region is dominated by Olympic National Park, the biggest and most beautiful “no mountain bikes allowed” zone in the entire state. 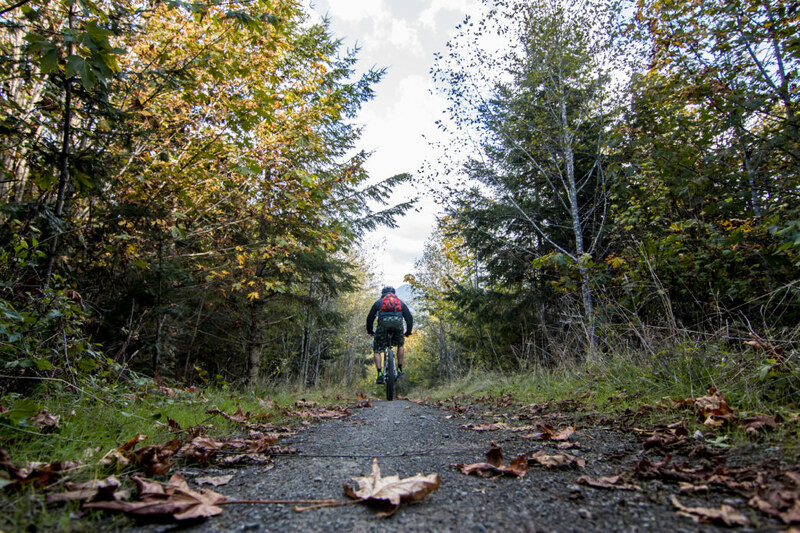 However, just north of the park, the Adventure Route of the Olympic Discovery Trail is a 25-mile section of well-maintained, bike-friendly singletrack that makes a trip to the Peninsula well worth it for riders of all abilities. With a trail width of three feet and a lack of technical sections, the Adventure Route is more sidewalk than singletrack. There’s just over 3,500 vertical feet of elevation gain over the course of the 25-mile trail, meaning that there are a few steep sections but the average grade is mellow. 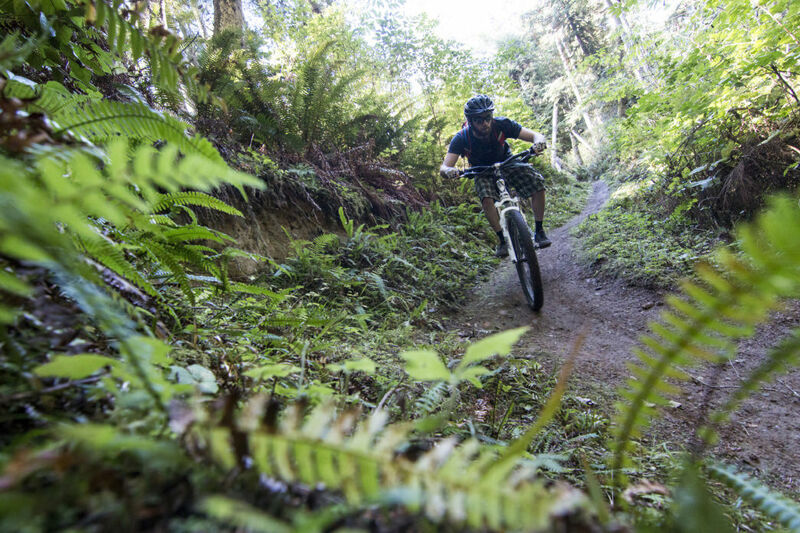 Still, there are moments of classic (albeit relatively tame) Pacific Northwest flow that will have first-timers and pros alike hooting through the looping fern tunnels. Beginners will dig the smooth and intuitive trail, while more advanced riders can crank up the speed and pound out some serious mileage. There are a few different ways to ride the Adventure Route, depending mainly on how far and long you want to ride, so we’ve broken down the trail below. Take note of the mileage and (generous) time approximations, as well as the logistics. 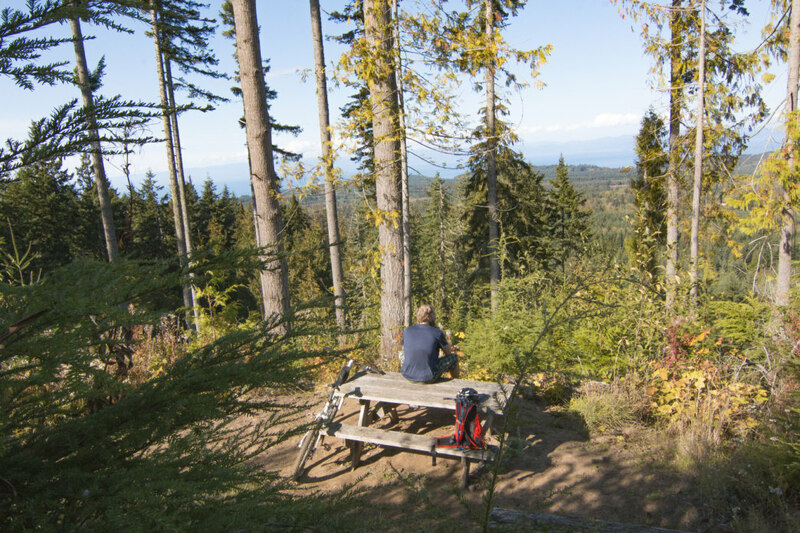 Then head to the Peninsula, hop in the saddle, and pedal one of the best trails in the region—all while taking in the spectacular views of Canada just across the Strait of San Juan de Fuca. If your ideal ride is less than 25 miles, no worries: the Adventure Route is easily enjoyed as an out-and-back ride. We recommend parking at the eastern trailhead, a well-marked pull-off just outside of Port Angeles, right after you turn off highway 101 onto SR 112 and cross the Elwha River. From that eastern trailhead, the Adventure Route starts with a manageable climb that undulates through the forest, pops into a clearing, and then dips back into the woods before reaching what locals have nicknamed the “Living Room” just after mile marker three. An opening with a couple wooden benches overlooking a magisterial river valley and the Olympics beyond, the aptly named Living Room is a solid spot to gauge your speed, grab some water, and take in the scenery. Continue onward for a fun descent down a few switchbacks, and then zip down a speedy, flow-oozing traverse to the base of the valley. At mile six, you’ll take on the second and toughest climb, topping out at mile marker nine nearly 1000 feet higher. This is where we recommend turning around if you’re in the market for a shorter out-and-back, as dropping the next downhill section gets you approximately halfway through the trail, and at that point you might rather just ride the whole trail. If you’re all about the climb, starting a point-to-point at the eastern trailhead off of SR 112 is the move. However, most riders will prefer starting at the western trailhead, as there’s a bit less climbing and arguably more flow riding from west to east. To do this, you can park at the Spruce Railroad Trailhead on East Beach Road off of 101. 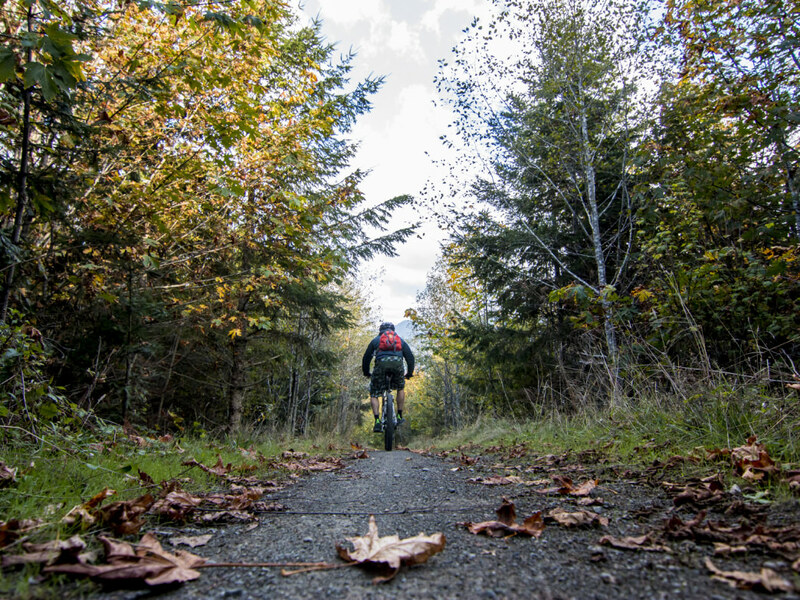 From East Beach, you’ll take on a gravel section as a warm-up, and then start to enjoy the tighter and more exhilarating singletrack just before you cross the Joyce-Piedmont Road at about four miles in. Also, coming from the west, the first serious climb doesn’t start until you’re already loose (7 miles in from Lake Crescent). After cranking through dense forests and traversing east, a few lightning-fast descents are broken up by tricky switchbacks. Between the flow and the smoothness of the trail, technically proficient riders with solid endurance can conceivably ride this entire trail without putting a foot down. However, there are plenty of picturesque spots to stop for a snack along the way, too. _Shuttle Tip:_If you’re doing a thru-ride solo, your best bet is taking the Clallam County Route 14 bus from Laird’s Corner to East Beach Road — this adds a few miles of riding on the road, but it’s flat and manageable. If you’re riding in a group, shuttling with two cars will save you the hassle. The Adventure Route is part of a much bigger beast, the Olympic Discovery Trail, a 126-mile chain of gravel, paved roads, and singletrack that meanders from Port Townsend on the east side of the Peninsula all the way to the coastal town of La Push on the west. Were it not for the Adventure Route, road bikers would easily tackle the entire trail, but fatter tires are recommended for the potential mud fest on the Adventure Route—assuming the Pacific Northwest delivers its notorious weather. Those interested in bikepacking the entire Discovery Trail can expect to spend most of their time on paved roads and gravel paths, with the Adventure Route singletrack being a cherry on top of a gorgeous traverse across the peninsula. The Adventure Route is a mixed use trail, meaning that you'll be sharing the trail with horses and hikers alike. Make sure to be respectful to fellow trail users. Fortunately, the Adventure Route doesn’t allow motorized vehicles. Unfortunately, that means there are quite a few metal barriers that keep out the mechanized riffraff. While you can coast through the barriers, you may want to dismount to avoid clanking your derailleur (we learned this the hard way). Speaking of which…bike issues? Stop by the Bike Garage on Lincoln, right across from the Safeway. If you’re looking for camping nearby, check out the Fairholme Campground. It’s not too far from the western trailhead, just on the opposite side of the breathtakingly blue Lake Crescent. If you’re in the market for a morning pick-me-up or want to bring a lunch with you on the trek, stop at Good To Go in Port Angeles (on the corner of Eunice and Lauridsen)—they have delectable pastries, good coffee, and ready-made sandwiches. If 25 miles isn’t enough, you can add a few more miles on the Spruce Railroad Trail, which branches off at the East Beach Road Trailhead and follows the curving coast of Lake Crescent. The trail is well-marked, both with markers every mile and arrows at each junction. That said, there are a few off-shoot trails (including more technical downhill sections for those so inclined) that are best explored through a little detective work on Strava. Happy hunting!